Engineers Ireland has announced the expansion of its Diploma course offering to engineers wishing to improve their continuing professional development (CPD). The professional membership body for engineers in Ireland in collaboration with NIBRT, the National Institute for Bioprocessing Research and Training, is expanding its CPD course choice to include a new 12-month TU Dublin-accredited Diploma to support engineers develop skills and knowledge of biopharmaceutical operations. Photo (l-r) Dee Kehoe, CPD Director at Engineers Ireland; John Milne, Training Director at NIBRT; Caroline Spillane, Director General of Engineers Ireland; Dominic Carolan, CEO of NIBRT; and Melissa Hoare, Senior Bioprocessing Trainer at NIBRT pictured at the launch of the new Engineering and Biopharmaceutical Operations Diploma, accredited by TU Dublin. The new programme rated Level 9 on the National Framework of Qualifications is entitled CPD Diploma in Professional Engineering and Biopharmaceutical Operations and will commence on 19 September. This stand-alone Diploma builds on the existing CPD Certificate and Diploma in Professional Engineering offered by Engineers Ireland under its Future Professionals series. Speaking about the new CPD Diploma in Professional Engineering and Biopharmaceutical Operations, Caroline Spillane, Director General, Engineers Ireland, said: “We are delighted to be collaborating with NIBRT – a world-class institute offering training and research solutions – to offer structured advancement for engineers to further develop their knowledge of biopharmaceutical operations. 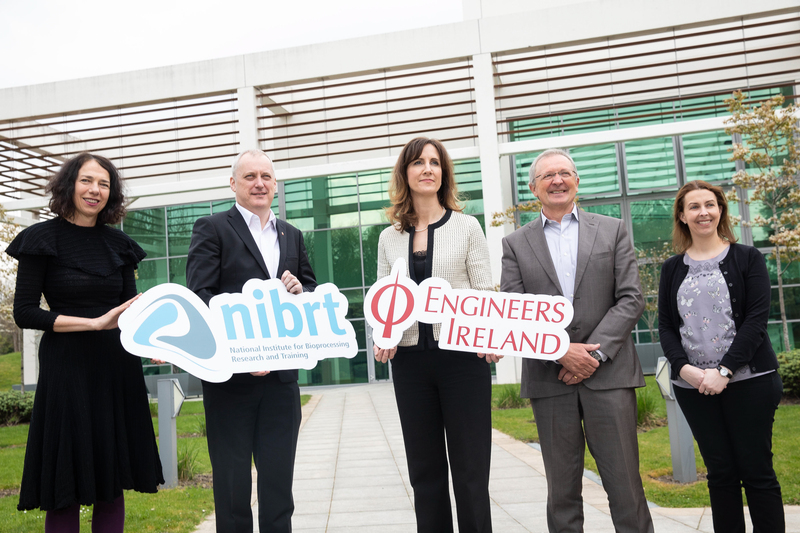 John Milne, Training Director, NIBRT said: “NIBRT is delighted to partner with Engineers Ireland on this exciting new programme. Ireland has seen tremendous growth in the biopharmaceutical industry in recent years. Engineering as a discipline will continue to play a crucial role in the successful operation of modern biopharmaceutical manufacturing facilities. The new Biopharmaceutical Operations Diploma will cover subject matter including Facility Design, Cleanroom Operations, as well as Upstream and Downstream Processing. Training days relating to core biopharmaceutical study will be delivered at NIBRT’s state-of-the-art bioprocessing facility in Blackrock, County Dublin. Other modules including engineering Project Management, Effective Leadership, Analysis to Action, Finance for Professional Engineers, Risk Analysis, advanced Presentation Skills, and the Team Project will be delivered in Engineers Ireland’s training facility in Ballsbridge, Dublin 4. The programme will be delivered on a part-time basis involving classroom and laboratory sessions, project work, assignments, research, and workplace mentoring. A Team Project spans the duration of the course. Successful students will receive a CPD Diploma in Professional Engineering and Biopharmaceutical Operations from Technological University Dublin (TU Dublin). It will be worth 30 European Credit Transfer System (ECTS) credits. As referenced above, The CPD Diploma Team Project involves teams of participants choosing a real-world challenge from one of their organisations and presenting a project solution/recommendation based on team research and analysis. Each project team will have an industry expert assigned to their project who will act as a supervisor to guide each team through the process. This module concludes with an opportunity for each group to present a business case for their project solution/recommendation to a panel of personnel from Engineers Ireland, TU Dublin and selected industry experts.